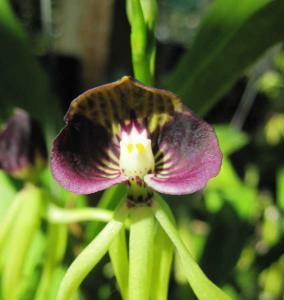 The estimated number of orchid species worldwide is 25.000 to 35.000, out of which 320 grow endemical in the Caribbean. 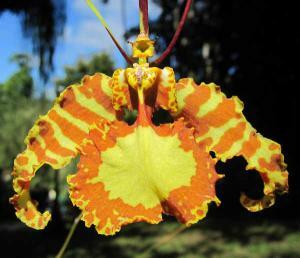 Colourful orchid with a shape reminding of a butterfly. 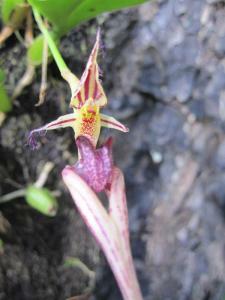 The orchid originates from South America. Essence: Helps express the inner beauty, to see things with ease and to live life easier and more cheerful. Helps us recognize that true happiness and beauty comes from within from our consciousness. Helps people in difficult and strainful situations, to be able to take things easier. Physical: As an assistance in terminal care. 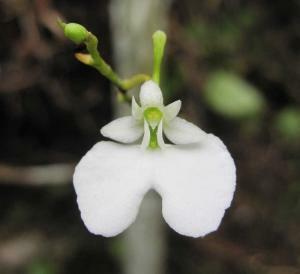 An orchid shaped like a small angel with a hood around the head. Essence: Whenever we feel tied, limited and constricted, helps us to open our mind and to break our inner boundaries. For people who wish to develop more tolerance and foresight, for people who are caught in dogmas and for people in sects. Helps on a mental level to recognize that we can expdand our potential. The essence is suitable to support our learning. 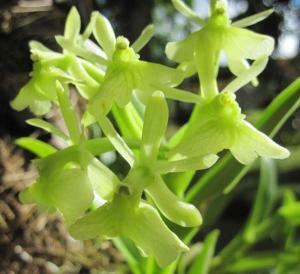 The petals as well as the leaves of this orchid contain chlorophyll and are also capable of photosynthesis. Essence: It may be applied in agriculture and horticulture to enhance the growth and health of the plant. Helps people to develop the so called “green fingers”. It promotes the communication with the plant kingdom, lets us develop love for plants and other forms of living. Gives us patience and persistency, connects us with the mental level. Connects intuition and logic, helps us to be able to make the right decisions. This orchid originates from Asia. Essence: Whenever we arrive at a point in our life, where we want to develop inwards. It connects with the highly spiritual level, for mental-spiritual development, for meditation. The Orchid helps us to stimulate deep self healing processes. It goes very high in it’S energy, it goes up to the limit of experiencing the forth dimention, in which there is neither space nore time. In future this orchid could be used for manned long-distance flights through space in order to bridge the experience of time for the astronauts.